Learn more about trenchless pipe repair! Do you have a clogged sewer line? Maybe someone has told you that you’ll have to destroy your yard or tear up your flooring in order to fix the problem. Not so fast! Trenchless sewer line repair could be the perfect solution. How do you know if you have a clogged sewer line? 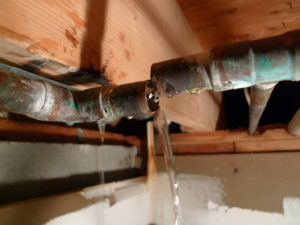 If you’ve noticed that your drainage system has started to slow down or if you’ve heard a gurgling sound coming from your toilet bowl, it could be time to act before serious damage takes place! But, to confirm a clogged sewer line we can conduct a video sewer inspection. This process avoids digging up your yard or floors by using a camera to find out exactly what and where the problem is. Not only does it confirm or diagnose the problem, it can also help the trenchless professionals determine the best solution. Tree root damage is a primary cause of a broken or clogged sewer line. However, other objects can find their way into the line and become lodged, creating a clog. Extreme temperature changes, ground shifting, improper installation and general deterioration can all lead to sewer line misalignment. Traditionally, sewer problems usually meant excavation on a large scale, requiring serious repairs after completion. Trenchless pipe repair is a faster option that only requires a few access points. Our trenchless sewer pipe replacement technology has saved our customers thousands of dollars…not to mention valuable time! There are two approaches to trenchless sewer repair: pipe bursting and pipe relining. With pipe bursting, the existing line is blown apart as a new, stronger high-density pipe is pulled through it. With pipe relining, a fiberglass line is placed inside the faulty pipe to seal any damage, creating a long-lasting repair. Contact the professionals at TRS to determine which trenchless repair method is right for you!